Here’s the scenario: I hand over my phone to my kids with a kid-friendly game or video playing, only to realize a few minutes later that they are removing my apps, browsing unfamiliar YouTube videos, and trying to send emails and texts to everyone in my contact list. Does that sound familiar to anyone else? With even very young kids as tech-savvy as they are, finding a way to lock down my phone in order to protect my kids (and the phone itself) has been essential. With both iOS and Android phones in our family, I’ve researched and compiled the best ways to make both types of phones kid-safe. Until recently, locking an iOS phone for a child to use was virtually impossible. I can’t tell you how frustrated my husband has been trying to prevent our kids from wreaking havoc on his iPhone because the Home button simply couldn’t be disabled. However, we’ve found two features built into the iOS software that make this frustration a thing of the past. Guided Access is a feature built into all iPhone 6 and newer models. Once it is turned on in your settings, you can activate it and lock any app so that your kids can’t navigate out of it. Guided Access can also disable the hardware buttons (On/Off, Home, Volume) and even disable parts of the screen. To set up Guided Access, go to Settings > General > Accessibility > Guided Access. Once there, you can turn Guided Access on and set a passcode to unlock it. Sleep/Wake button: By turning this off, you’ll prevent your child from accidentally turning off the phone. Volume buttons: Make sure the volume is set where you want it before disabling the volume control buttons. Motion: This disables the phone’s auto-rotate feature. Keyboards: Disabling the keyboard from showing is helpful depending on the type of app you’re setting up. Touch: While disabling the touchscreen doesn’t make sense for games, it can be very useful if, for example, you are setting up a movie on YouTube and don’t want your child to be able to do anything but watch it. Time limit: Setting a time limit can ensure your child doesn’t spend too long on any one game or app and helps you enforce your guidelines. From the main Guided Access screen, you can also circle any areas of the screen that you’d like to disable. Draw a circle around an area and a bubble will appear that you can shrink or size as desired. This is particularly helpful if a favorite game app has an ad icon in one corner of the screen and you don’t want your toddler constantly opening new ads and draining your data. Once you’ve got your settings in place, hit “Start” at the top of the main Guided Access screen to begin a session. To end the session, triple-click the Home button and enter your Guided Access passcode. That will take you to the main screen again, and you can choose whether to end the session from there. After you’ve set up Guided Access for an app, it will automatically apply those settings the next time you open the app and turn on Guided Access. If you want to change something (for example, if you need to turn off the volume buttons or adjust the time limit), exit Guided Access to reach the opening screen with the “Options” button and adjustable features. From there, you can make adjustments and either resume the Guided Access session or end the session. My husband has used the Guided Access feature many times on both his iPhone and iPad and we’ve yet to find any flaws in its design or execution. This is hands-down the best way to lock your iPhone and make it safe for kids to use. The Restrictions section of your phone is another way to protect it from curious little ones. Go to Settings > General > Restrictions. If you’re doing this for the first time, after you tap “Enable Restrictions,” you’ll be prompted to create a Restrictions passcode. With Restrictions enabled, you can set allowable content levels for websites, movies/music/games, and some specific apps, plus you can create lists of specifically approved or blocked websites. You can even completely disable specific apps as well as the ability to install or delete apps or make in-app purchases. We recommend using these settings even if you have Guided Access set up, so your phone is protected if it falls into little hands while you’re not looking. Because the Android OS software is used by several different phone manufacturers, there’s a wider variety of parental control options and ways those controls are implemented. There are some general ways to kid-proof your Android phone, but some of these features may not be included depending on the type of phone you have. If you can’t find something on your device that is listed here, check with the manufacturer (LG, Samsung, HTC, etc.) to find out what your options are. If you are using a device with Android 5.0 or newer, you can “pin” an app so your child won’t be able to exit that app until you unlock it. I’ve found this to be extremely helpful in limiting what my kids can get into on my phone, and it’s pretty much foolproof as far as preventing them from exiting the app without my permission. To turn on this feature, go to Settings > Security. Scroll until you find the Additional Options or Advanced section, and then find “Pin windows” or “Screen pinning” or something similar. Simply turn on this feature and it will be available to you anytime. The app most recently opened (which should be the one you want to pin) will have an icon of a pin on it; tap the icon. The app will open, but it will be pinned, which means you can’t exit the app unless you unpin it. Different devices will have different ways of unpinning an app. For my HTC phone, I have to hold down both the Back button and the Recent Apps button at the same time, which I have found to be tricky. For other phones, you may only need to hold down the Overview/Recent Apps button for several seconds; each device will provide instructions for exiting the app when it is pinned. You can restrict app installations or in-app purchases by adjusting the settings and creating a password in Google Play. This is a great thing to do, regardless of any other kid-proofing you have set up, in case a child gets ahold of your phone without you realizing it. Plus, it’s a very simple process. Under the Settings menu, scroll down to Parental or User Controls and turn it on, then set the content restrictions. This will prevent your child from accidentally installing anything inappropriate. Also look for an option to “Require password for purchases” (or something similar) and turn that feature on as well. That will prevent new installations or unauthorized purchases. Any Android device with Android 5.0 or newer can theoretically be set up with multiple user accounts. I say “theoretically” because this feature is widely available on tablets but is limited on phones. My HTC phone doesn’t have this option at all, but I found that it worked really well on my tablet. You’ll find that some devices will automatically create a “guest” account, some will give you the option of creating a “restricted” account, and others will ask you to specify if it’s an adult or child account and automatically provide restrictions for the latter. With a child or restricted account, you can limit the user to a handful of approved apps and nothing else. To create multiple accounts, visit Settings > Users. Tap “Add User” (or something similar) and if you have the option, choose “Restricted Profile.” Select which of the listed apps you want the Restricted Profile to have access to and adjust settings as needed. In order to switch between users, you may simply need to swipe down and tap the Switch User icon at the top right of the screen. The exact technique will vary for different phones, but the general method should be similar. I found it very easy to set up a child profile account on my tablet. Once I had it set up, I added the apps and content I wanted my kids to have and that was it. I was even able to set bedtime hours and time limits for that user account. The account was easy to log in to from the lock screen, and unfortunately, it was just as easy to log out of. However, once I added a password to my main account, I didn’t have to worry about my kids switching profiles. Even with these precautions in place on your Android device, you might still want an app that will entertain your small ones without letting them roam freely on your phone. I installed and tested a wide variety of free parental control apps on my Android phone and tablet, and here are my top recommendations. The Kids Place app is a “sandbox” app, which means it displays only those apps that you’ve approved for your child to explore. All other phone accessibility is limited, including the Notifications bar and the Recent Apps button, and a PIN is required to exit the app or adjust the settings. Kids Place will even block any unapproved apps that an approved app tries to open. (For example, I approved the camera app but not Instagram, so if my kids try to post a photo to Instagram, they will be redirected to the Kids Place dashboard.) The Home button does not automatically lock, so be sure to go into the Parental Control settings and enable that feature. In Settings, you can also block app marketplaces, block incoming phone calls, turn on an “Auto restart” feature in case small children accidentally close an app, set a timer, and even lock the volume settings (one of my favorite features). You can create multiple user accounts for your kids, and they can switch between them easily. If you decide to give your kids a web browser in their “sandbox,” you can create a whitelist of approved websites. Wi-Fi can be turned off for individual apps or even altogether. I found this reassuring on my phone, but when I tested it out on my tablet, I discovered I had to manually reconnect to Wi-Fi after exiting out of Kids Place—not convenient if you find yourself switching Kids Place on and off frequently. Kids Place offers website, video, and picture filtering, but additional plug-ins must be installed. Several additional features (such as an advanced schedule-based timer) are available through the Premium version of the app for $4.99. I didn’t see anything in the Premium features that would justify the extra cost for me, but I did appreciate that the app didn’t constantly encourage me to upgrade as some other apps do. Overall this was the best app I found for creating a safe space for your kids to have access to only the apps and features you want them to have. While there are a few minor drawbacks, there is a lot for both parents and kids to like about this app. 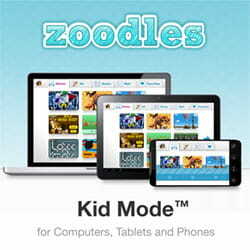 Kid Mode is a highly rated kid-safe app—so much so that it comes preinstalled on many Android devices (including my HTC phone). Kid Mode comes with kid-friendly games, videos, and books (including an option to record yourself reading the books for younger kids), plus a painting/drawing feature. You can add your own apps to the “Toybox,” though you have to dig around within the app to find them after they’ve been added. What I liked as a parent is that it was easy to set up multiple user profiles and I could customize each one with daily time limits (for both weekdays and weekends), set a violence filter for video content, and ask the app to promote specific languages or subjects for each user (like math, reading, science, or even creative skills). When I started Kid Mode, I could choose to make it my “Home” default so that my phone went straight into Kid Mode if my phone was turned off and then back on, essentially disabling both the Back and Home buttons within the app. In order to exit a child’s profile, the parent’s birth year has to be entered as the password. The interface was very easy to use and navigate through, which is a big plus in my book. One of the things I did not like was that even though my Home and Back buttons were disabled, the Recent Apps button still worked and I could navigate away from Kid Mode that way. I could also pull down my Notifications and Settings bar, though it was not easy to do, and I could still adjust the volume when the app was running. Phone calls are not blocked, so my kids can answer incoming calls, but once a call ends, the phone goes right back into Kid Mode. I also didn’t like that I couldn’t switch between child profiles on the main dashboard without entering the password (which makes it much harder to let my kids share without my help), but that’s a small inconvenience. Overall, my kids and I really liked this app’s content, features, and security measures, and it is one we will be using in the future. 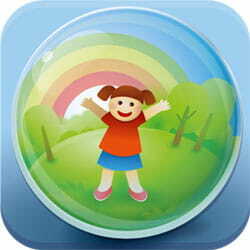 The KidsWorld app is a mix between a “sandbox” app and one that provides its own kid-friendly content. Because it tries to do two things, it doesn’t do either one as well as the other top picks, but its features and security were enough to give it a place on the list. The “sandbox” feature is very straightforward. Upon opening, you can choose to set a time limit (from 5 minutes to an hour) and add apps already installed on your phone, as well as videos or pictures from your phone. After setup, your selected apps appear on the main screen along with a countdown timer, and on the next screen is a handful of kid-friendly videos and songs. It’s pretty basic, but also very easy to navigate and follow. 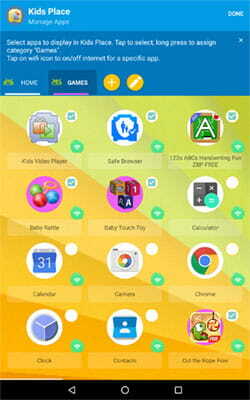 KidsWorld offers different ways to exit the app. The easiest way is to simply hold down the Exit button, but as this is easy enough for a child to do, this can be disabled in Settings. Another way is to tap the Back button twice and enter a password when prompted. The Settings options are rather sparse, especially compared to other apps, though you can choose to accept incoming phone calls and adjust some features in YouTube. Ads and in-app purchases are blocked as well. A handful of additional options, including turning Wi-Fi off, are available with a Premium subscription, but again, the limited options didn’t seem worth an upgrade to me. The biggest drawback, as with Kid Mode above, is that while the Home and Back buttons on my phone were disabled, the Recent Apps button worked, potentially allowing my kids to navigate away from KidsWorld. I found that with a little persistence, I could also pull down the Notifications bar as well. Overall, it was a good kid-safe app with most of the features you’d want. With one or more of these phone-locking features and apps in place, you should be able to hand your phone over to one of your little ones without worrying that your phone and its contents will be rearranged when you get it back. Plus, you don’t need to worry about what your children are looking at—even if they use your mobile device while you aren’t looking. Whether you choose to give them several apps to explore or lock them into one app at a time, these parental control options for both iOS and Android phones will contribute to your family’s overall sense of internet security.